Registration is essential to our program’s planning, purchasing, communication, and overall successful management. Click here to access our convenient online registration form. Hard copy registration forms are located on the church bulletin board. 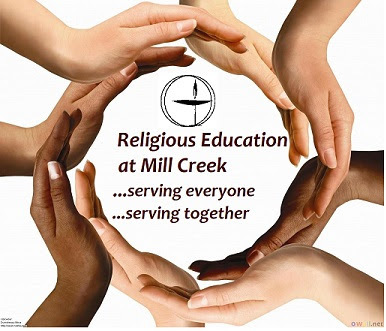 Click here to learn more about our Religious Exploration Program. Guided by our shared principles as Unitarian Universalists, we provide an atmosphere that facilitates spiritual and ethical development for all ages in a safe and welcoming environment. Following the Story for All Ages in worship, Children and Youth will report to their classrooms for an hour of learning, friendship and fun! Roots and Shoots Friends will partner with our gardening and meadow team to prep for our congregation-wide tree planting day! During the Religious Education hour, all Youth will meet in the library to talk about UU heroes of Social Justice. Following worship, the O.W.L. class will meet in classroom #4 for their session on Gender Expression, Roles and Stereotypes. Join us as we explore what it means to be a UU in our Adult RE series, “Faith Like a River.” Come explore the course of UU history—people, ideas, and movements that shape our faith heritage. Sunday mornings in the MacArtor Library, 9:15–10:15 am, September 30 through November 11. No registration necessary. Drop-ins are most welcome – coffee provided! This Sunday in Adult Religious Exploration: Ripples in the Water: The Evangelists Mary Higgins leads this workshop looking at how our faith history helped our movement to grow. We may not think of ourselves as an evangelical faith, but many have worked to intentionally spread Unitarian and Universalist thought. This Sunday, we’ll explore ways we can continue to make our heritage a living history. Let’s talk about it. Speaking of Adult Religious Exploration…. Join us for our Adult RE Team Meeting! We’ll be locking in our offerings for Winter/Spring and hearing your ideas and suggestions for new class offerings. Hope to see you there on Sunday, November 11th, 12 noon to 1 pm in the MacArtor Library.